Taxi airport Podgorica to Budva district at the price of 40 Euros per vehicle is recognized as transportation service in almost every fourth online claim which we are receiving. If you're wondering why - until you visit Budva It is difficult to explain. If you plan to visit this tourist capital of Montenegro, and you need to online schedule taxi from Podgorica airport to Budva Sveti Stefan Becici we can provide you with excellent taxi service at an affordable price. Budva is one of the oldest cities at Adriatic sea coast, and with the reason is named Montenegrian queen of glamor. Taxi Podgorica airport to Budva and Becici is the most common taxi request in our company. Budva is only 65 kilometers far from the airport in Podgorica. If you are traveling from airport Podgorica to Budva you can do it using the three directions. First one is via Podgorica and Cetinje, and the other two are through Sozina tunnel, or by mountain road. Transportation from Podgorica airport to Budva or Becici is recommend as taxi ride by the mountain road because of the beautiful view on Montenegrin mountains and Skadar lake. In less than 45 minutes you will climb up to almost 1.000m altitude and come down to the sea level. Why transportation Podgorica airport to Budva is so popular ? Because of sandy beaches in and around Budva which stretch for more than 11 km transport from airport Podgorica to Budva is popular among the all types of tourists. This region is one of the best places in Montenegro for family vacation. The most famous beach is Mogren, visited by taxi from Podgorica to Budva by local peoples as clients. Many other beaches are located just outside of Budva in smaller adjacent places and villages, and they are among the most beautiful beaches in the world. That is just a reason more for so often request for taxi transfer from airport Podgorica to Budva. Queen of Tourism and glamor – Budva is known for its many appearances of famous stars: concert of The Rolling Stones in 2007th, concert of Madonna in 2008th, David Guetta Concert 29 July 2011 etc.. Here you will find more information about Budva. You can book your taxi from Podgorica airport to Budva whenever you want, because transportation costs are the same throughout the year. The price is fixed and there is nothing that can change it, delay of aircraft, weather conditions, size of luggage etc . . .
Our driver will wait for you at Podgorica airport with a sign with your name, next to the airport exit. Do not worry that you will not notice him, Podgorica airport has just one exit. He will provide you with a safe and comfortable transportation service Podgorica airport to Budva. All our vehicles are new, and adapted for airport transfers. Book in advance your transfer, for a sure you will get cheap taxi airport Podgorica to Budva Becici Milocer. You can contact us by our contact form, by email, or by phone call or sms. All staff in call centre speak an excellent English language, as many of our drivers. 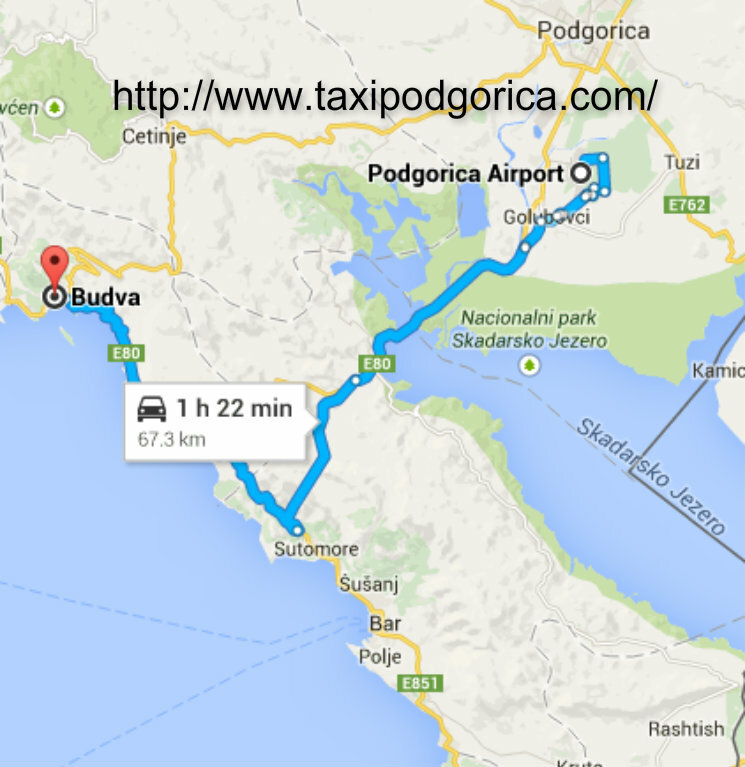 Taxi Podgorica airport to Budva cost 40 eur, distance is 65 km and ride takes about 1 hour. Here you can also schedule your return transfer from any address in Budva. For round trip same rules apply. Taxi from Budva to airport Podgorica can be booked as single ride, even if you didn't use our service on arrival. Taxi from airport Podgorica to Budva is cheaper than bus ! If you are making a plan to take a bus as transportation from Podgorica bus station to Budva, Sveti Stefan or Becici please read this paragraph. You will realize that when at least two travelers are going by taxi from Podgorica airport directly to Budva, expenses are equal as to use the bus. For three or four passengers together, we guarantee that our service is cheaper. Our price of 40 euros includes pick up, all taxes, drop off at your address and taxi transfer airport Podgorica to Budva city area. Bus ticket cost about seven euros, plus one euro station service, plus tax for each piece of luggage. That are travel costs per one person. Of course, you have to add a ride from the airport to bus station 10 eur, and taxi in Budva which is during the season very expensive. In total taxi transport airport Podgorica Budva in combination with the bus is not so cost effective. Also, when you calculate the lost time you see that this combination is not very realistic. Thousands of satisfied customers recommended our inexpensive service taxi from Podgorica airport to Budva to the others travelers. If you're curious why, book a ride and you will find out.